The first night of this year's Mickey’s Halloween Party at Disneyland began on Friday, Sept. 25 and I was there as a guest of the Disneyland Resort with my 11 year-old niece and 8 year-old nephew to celebrate with family-friendly screams and sweets! All 17 nights of Mickey's Halloween Party at Disneyland are extra special this year as they sparkle with Diamond Celebration bling, including the all new "Paint the Night" parade. This parade is a must-see family favorite that will seriously leave you with your jaw wide open. Trust me. I've seen it three times now and it's like the first time. Every. Single. Time. Insider Tip: If you have seen the parade, skip it and hop on attractions! The lines for attractions are not very long at all during Mickey's Halloween Party. The biggest perk of Mickey's Halloween Party is that all guests dress in costume and trick-or-treat throughout Disneyland park. Major stoke factor! I have way too many costumes for a woman in her 40s and the kids have tons of faves that they use for play at home so, as you can imagine, preparation for the party included deciding which costumes to wear. After checking the forecast we all decided on the following costumes: Woody (me), the Queen of Hearts (Rosey) and a Pirate on the Black Pearl (Ernesto). When we met Mickey and Minnie they both agreed that our costumes were spooktacular! 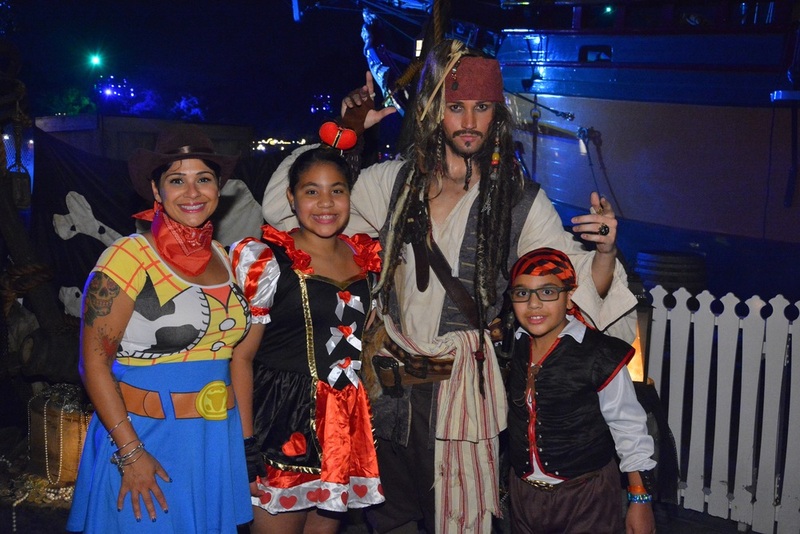 Meeting favorite characters, including Disney Villains, is one of the major highlights of Mickey's Halloween Party. 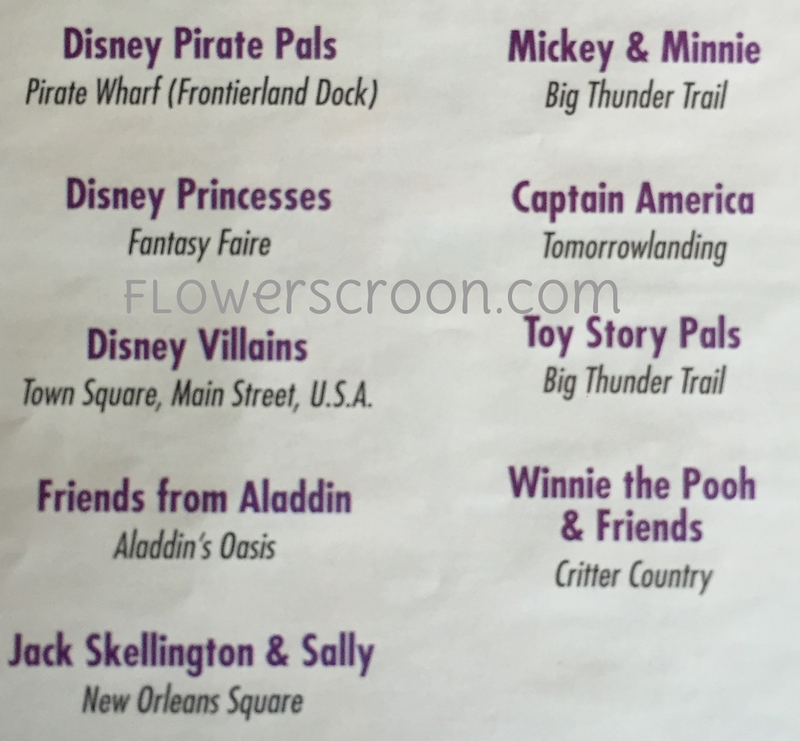 The map you receive when you arrive shows you where you can meet characters throughout the park. (Insider Tip: I have a snap shot of character locations for you below.) This is a great way to plan who you want to meet ahead of time. 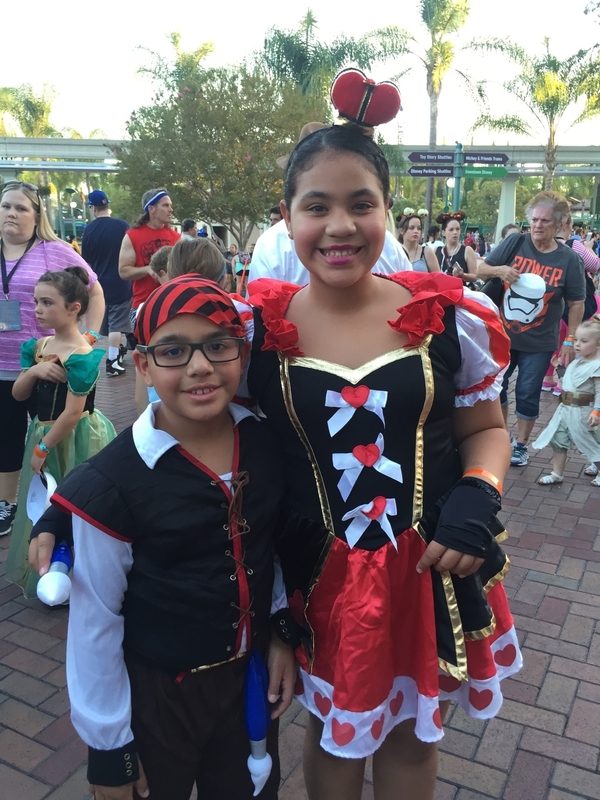 Ernesto was able to meet with Captain Jack Sparrow and Rosey was able to see her favorite villain, Maleficent (although the line was too long to stand in for her liking). She was completely content with a little magical interaction from her favorite gorgeously perfect villain rather than lose trick-or-treat or attraction time. Another bonus to Mickey's Halloween Party is the exclusive entertainment. As in the Cadaver Dans crooning Halloween jams on the eerie Rivers of America in New Orleans Square & Frontierland PLUS Halloween Screams - A Villainous Surprise in the Skies Fireworks. Basically the most epic Halloween themed fireworks show ever. You can even go to Tomorrowland for the Monsters U Dance Party! Insider Tip: The best spot for viewing the fireworks is just in front of the castle itself, but that can sometimes be a crowded area to get to. A great alternative is in the middle of Main Street U.S.A. As soon as the "Paint the Night" parade ends (after Mickey's float passes by), guests can spill right back onto Main Street U.S.A. to watch the fireworks. Don't panic if you can't find a spot smack dab in the middle of Main Street. As long as the castle is in view, you're fine. The fireworks happen high in the sky and the villainous music will surround you! Two special attractions you can enjoy during Halloween Time at Disneyland are Space Mountain: Ghost Galaxy and Haunted Mansion Holiday. 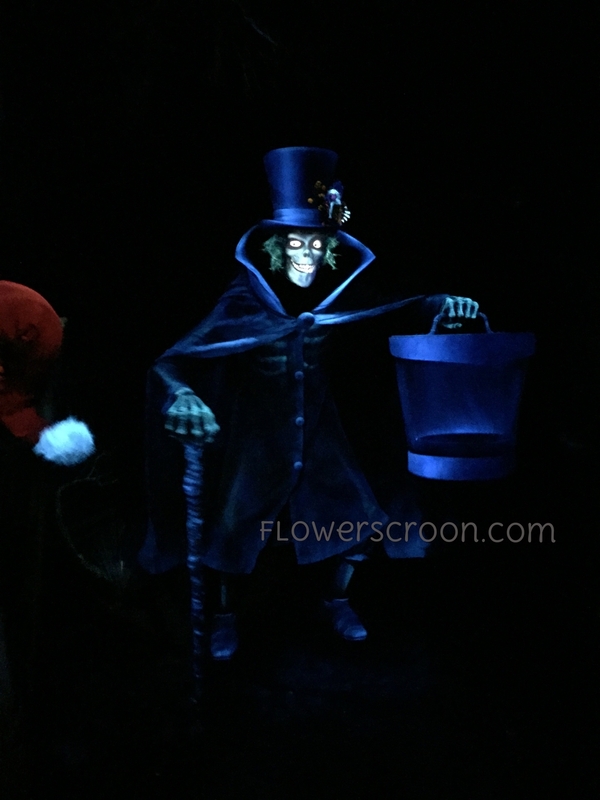 Haunted Mansion fans take note: the Hatbox Ghost is making his first ever appearance in Haunted Mansion Holiday this year! YES! Insider Tip: Ride Space Mountain Ghost Galaxy soon, it's only here until November 1, 2015 whereas Haunted Mansion Holiday will be around the entire Holiday season through early January 2016. Rosey's answer was, "I liked that there were so many Trick or Trick stations and that they were all over the place!" It really was super convenient to have Treat Stops spread out all over the park. Plus, the Treat Stops have sweets and healthy treats, so parents can pick and choose what the kids are eating on the sly if necessary. Wink. 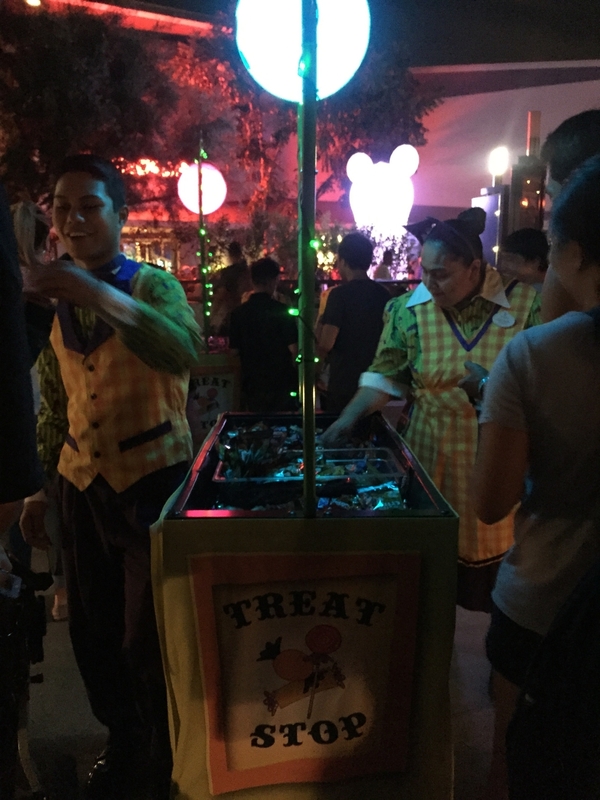 Insider Tip: Treat Stops may seem crowded early in the evening, but the lines for everything die down after the "Halloween Screams" fireworks show. Have a character/entertainment plan. Decide ahead of time which characters and shows are "musts" for you and your family. The character lines can be quite long so plan on having a back-up plan as well. 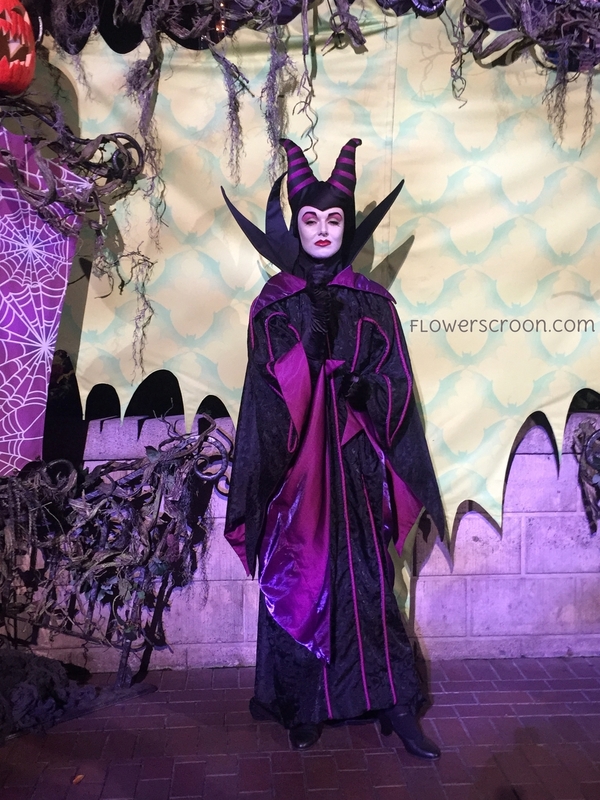 In our case, Rosey was really happy to interact with Maleficient from afar rather than stand in the line to see her. Ernesto insisted we see Captain Jack Sparrow so as a family we decided that is where we would wait. 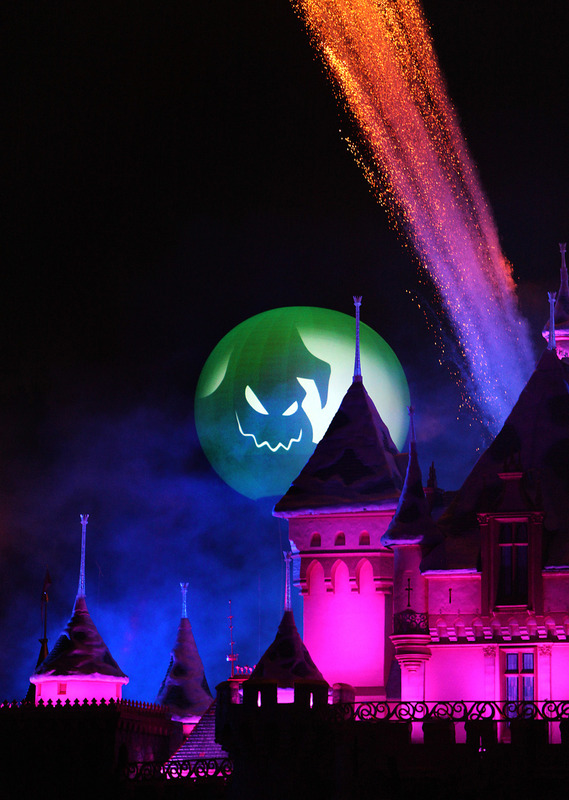 Remember, the "Halloween Screams" fireworks show is exclusive to Mickey's Halloween Party. I recommend you don't miss it! Check the forecast and plan costumes accordingly. Southern California can be extremely hot and humid in early Fall, so please do check the weather forecast. 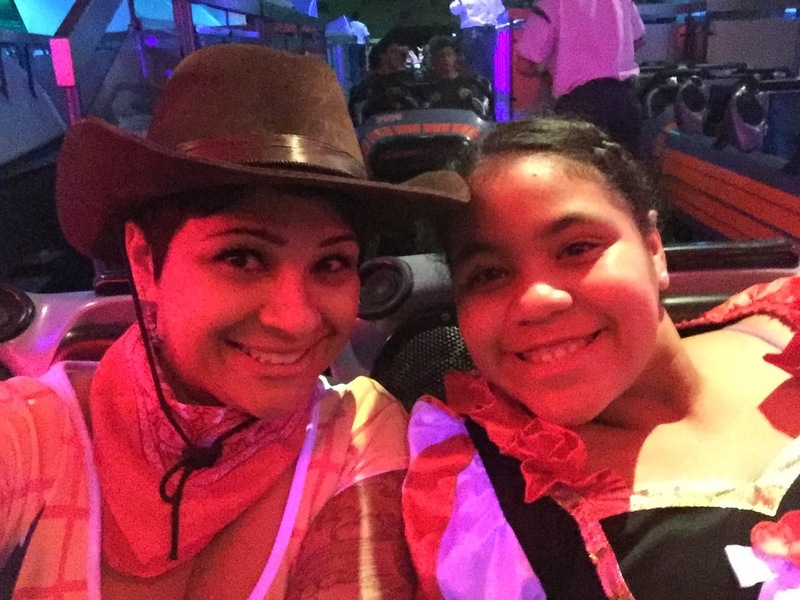 My costume was a simple Woody dress I paired with a cowboy hat and bandana in order to be comfortable and still enjoy myself. You can go as big or small as you choose in terms of costumes - just be sure to follow the guidelines and wear comfortable shoes! Bring one bag or a backpack for the family to share. If you don't have a stroller, a bag or backpack will come in handy to carry around those "spare" costume pieces you start shredding as the night goes on. It's also a great way to hide candy you don't want the kids eating right away. Carry your extra water in the bag as well! Accept that you can't do it all and enjoy a break. We all woke up at 4:00 AM the day of the party in order to fly down, and by 11:00 PM Ernesto was ready to tap out. That's when we sat down and enjoyed a solid half hour of visual entertainment in front of Sleeping Beauty Castle before making our way back to the Disneyland Hotel. There is nothing wrong with knowing when to say when. One common mistake I see parents making is forcing their kids to stick it out. That's not fun for anyone. This trip was all about the kids and I kept that in perspective the entire time. (There is always the option to purchase tickets for an adult night out at Mickey's Halloween Party too!) Many shops are open and so are several restaurants. Refer to your map for spots to enjoy a little down time. I recommend the benches in front of Sleeping Beauty Castle. Get there early! Your ticket to Mickey's Halloween Party includes early entry into Disneyland. Take this opportunity to play in Disneyland park for three hours before the party starts! You will receive your wristbands and trick-or-treat bags in the park, so there is no need to line up outside again. This is a great time to enjoy attractions, have an early dinner and take photos while the sun is out and the costumes are fresh. Buy tickets online and on mobile devices at Disneyland.com/party, as well as at the Disneyland Resort main gate and by phone at 714-781- 4400. I recommend you buy your tickets in advance rather than trying to buy them at the park. Call and look online to check for availability for the 17 nights: Friday, Sept. 25; Monday, Sept. 28, Wednesday, Sept. 30; Friday, Oct. 2; Monday, Oct. 5; Wednesday, Oct. 7; Friday, Oct. 9; Monday, Oct. 12; Wednesday, Oct. 14; Friday, Oct. 16; Monday, Oct. 19; Thursday, Oct. 22; Friday, Oct. 23; Sunday, Oct. 25; Tuesday, Oct. 27; and Thursday, Oct. 29. Tickets for Halloween night, Saturday, Oct. 31, are sold out. Online and mobile purchases are not available the day of the event. Disclosure: I was invited to the opening night of Mickey's Halloween Party at Disneyland as a media guest of the Disneyland Resort. We were provided entry into the event, however all opinions and tips come directly from me, Rosey and Ernesto. © Jindy Garfias, Jindy Media FlowersCroon.com, WonderlandDiaries.com 2003 - 2018. Unauthorized use and/or duplication of this material without express and written permission from this site’s author and/or owner is strictly prohibited. Excerpts and links may be used, with the author's permission, provided that full and clear credit is given to Jindy Garfias and WonderlandDiaries.com with appropriate and specific direction to the original content.